Cardiovascular disorders and therapies are often associated with a variety of dermatologic manifestations. Frequently, these cutaneous signs can be used in facilitating a diagnosis of the underlying cardiac disease. For example, the diagnosis of acute rheumatic fever in patients presenting with acute carditis includes 2 skin signs out of the 5 classic Jones criteria (ie, arthritis, carditis, erythema marginatum, subcutaneous nodules, and chorea). Certain congenital cardiac defects are associated with unique skin manifestations, such as coarctation of the aorta associated with external features of Turner syndrome or atrioventricular (AV) septal defects associated with skin features of Down syndrome. In some patients, the dermatologic manifestations represent a component of a full systemic or vascular disorder that also involves defects in the cardiovascular system as another accompanying component. Advanced medical and invasive therapies have led to recognition of many new dermatologic manifestations, for example, angioedema from ACE inhibitors, ankle swelling due to calcium channel blockers, or radiation skin burns following prolonged angioplasty and radiation exposure. Calcium channel blockers and ACE inhibitors have also been reported to cause drug-induced cutaneous lupus erythematosus. The image below illustrates cutaneous bleeding in a patient on warfarin therapy for atrial fibrillation. Cutaneous bleeding in a patient on warfarin (Coumadin) therapy for atrial fibrillation. In this article, a discussion of some of the more common and clinically relevant dermatologic manifestations encountered in cardiac patients is reviewed, along with plausible differentials as applicable. Knowledge of many of the skin manifestations in the setting of cardiac diseases has become very important and is immensely helpful for proper diagnosis and treatment of patients with cardiovascular disorders. For excellent patient education resources, visit eMedicineHealth's Heart Health Center and Cholesterol Center. Also, see eMedicineHealth's patient education articles Coronary Heart Disease, High Cholesterol, Cholesterol FAQs, and Atorvastatin (Lipitor). The Medscape Heart Failure Resource Center may be of interest. Clubbing, as illustrated below, is seen in persons with cyanotic congenital heart diseases (eg, tetralogy of Fallot, Eisenmenger syndrome). It is also seen in persons with infective endocarditis. The differential diagnosis may include hereditary, idiopathic, constitutional, or acquired conditions. The acquired causes include pulmonary conditions (ie, primary and metastatic lung cancer, bronchiectasis, lung abscess, cystic fibrosis, mesothelioma) or gastrointestinal diseases (ie, regional enteritis, ulcerative colitis, cirrhosis). Schematic representation of clubbing of a finger in a patient with Eisenmenger syndrome (right-to-left shunt). Cyanosis is a bluish discoloration of the skin and mucous membranes due to an increased amount of reduced hemoglobin in the small blood vessels of the skin. 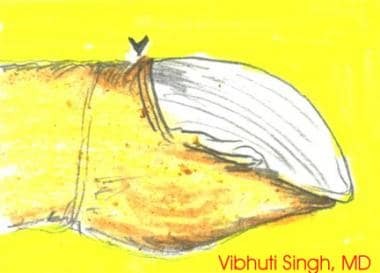 It is most appreciable in the lips, nail beds, earlobes, and cheeks. The mechanism includes either dilatation of cutaneous venules or a reduction in the oxygen saturation of intracapillary blood. Cyanosis manifests when the absolute concentration of reduced hemoglobin exceeds 5 g/dL. Cyanosis may be central or peripheral. In the central type, the desaturation of the arterial blood affects both the mucous membranes and the skin. In peripheral cyanosis, a slowing of blood flow and overextraction of oxygen from blood occurs as a result of vasoconstriction and reduced peripheral blood flow owing to cold exposure, shock, congestive heart failure (CHF), or peripheral vascular disease. Differential cyanosis occurs in patients with patent ductus arteriosus, pulmonary hypertension, and right-to-left shunt. Differential cyanosis is when cyanosis occurs in the lower but not in the upper extremities. Mild cyanosis of the lips, cheeks, and malar prominences, without clubbing of the fingers, is often seen in patients with mitral stenosis. It results from slight arterial hypoxia due to fibrotic changes in the lungs that develop because of long-standing pulmonary congestion combined with low cardiac output. Edema is defined as a clinically apparent increase in the interstitial fluid volume. A weight gain of several pounds over dry weight occurs before overt manifestations of edema. Edema may be localized or generalized (eg, edema involving the face, trunk, and extremities, termed anasarca). Edema may manifest as puffiness of the face (mainly in the periorbital areas) or as skin swelling that retains an indentation if pressed with a finger (ie, pitting edema). In the early stages, patients report that their rings fit more snugly on their fingers or they are having difficulty putting on shoes, particularly in the evening. The image below illustrates bilateral pitting edema in the lower extremities. Bilateral pitting edema in a patient with congestive heart failure. These forces regulate the exchange of fluid between the 2 components (vascular and extravascular) of the extracellular compartment. The hydrostatic pressure within the vessels and the colloid oncotic pressure in the interstitial fluid tend to move fluid out of the vessels to the extravascular space. On the other hand, the hydrostatic pressure within the interstitial fluid (tissue tension) and the colloid oncotic pressure within the vascular system (from plasma proteins) promote the movement of fluid into the vascular compartment. These forces are usually balanced. The development of edema depends on one or more changes in the Starling forces such that a net movement of fluid occurs from the vascular system into the interstitium. Edema also may result from damage to the capillary endothelium from chemical, bacterial, thermal, mechanical, or immunologic causes, leading to increased permeability and, thus, movement of protein into the interstitial compartment. The extravascular colloid oncotic pressure rises, causing net fluid movement outside of the vessels. Patients with reduced effective arterial blood volume respond by increasing salt retention and, therefore, water retention by the proximal tubule, which leads to edema. Causes include CHF, low cardiac output states, nephrotic syndrome, and cirrhosis. The condition is made worse by the renin-angiotensin-aldosterone system, which responds by acting on the efferent renal arterioles and increasing Na+ reabsorption in the proximal tubule. This system also operates locally. Both circulating and renally produced angiotensin II contribute to renal vasoconstriction and to salt and water retention. Arginine vasopressin and endothelin levels are also elevated in persons with CHF and contribute to renal vasoconstriction, Na+ retention, and edema. In contrast, the atrial natriuretic peptides increase glomerular filtration, inhibit sodium reabsorption in the proximal tubule, and inhibit release of renin and aldosterone, leading to a reduction in sodium retention. The 2 main cardiovascular causes include CHF and venous insufficiency. 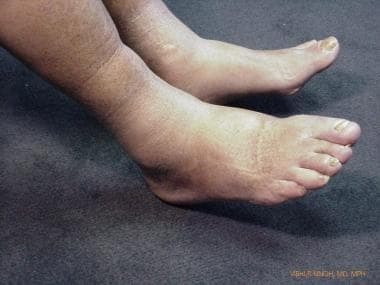 Usually, the edema is symmetrical over both ankles in patients with CHF. If CHF patients are bedridden, the edema appears over the sacral area. 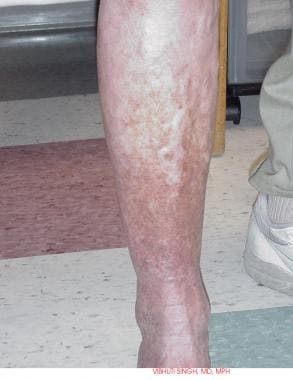 Edema of venous insufficiency may be associated with hyperpigmentation of the skin due to venous stasis. Ulceration may occur. Patients should reduce salt intake, rest in the supine position each day, and wear elastic stockings, which should be put on before arising in the morning. Diuretics are helpful initially. Medications, including ACE inhibitors, progesterone, the dopamine receptor agonist bromocriptine, and sympathomimetic amine dextroamphetamine may be useful when administered to patients with resistant edema. Ascites is characterized by a tensely distended abdomen with tightly stretched skin, bulging flanks, and everted umbilicus. It is often seen in patients with CHF, tricuspid valve disease, and constrictive pericarditis. Abdominal distension may be noticed first by the patient in the form of a progressive increase in belt or dress size or the appearance of hernias. Progressive abdominal swelling may be associated with a sensation of pulling or stretching of the flanks or groins. Ask the patient with diffuse abdominal swelling about alcohol intake, a past history of jaundice or hematuria, or an alteration in bowel habits. Such historical information may help differentiate the usual causes (eg, cirrhosis, a colonic tumor involving the peritoneum, CHF, nephrosis). The presence of peritoneal fluid (ascites) is indicated by demonstrating a percussion fluid wave and flank dullness that shifts with a change in position. In patients who are obese, small amounts of fluid may be difficult to demonstrate; on occasion, the fluid may be detected by abdominal percussion with patients on their hands and knees. Small amounts of ascites can often be detected only by ultrasound examination of the abdomen. An abdominal radiograph shows a ground-glass appearance, and a CT scan of the abdomen also may be helpful in the diagnosis. The evaluation of a patient with ascites requires that the cause of the ascites be established. In most cases, ascites appear as a part of a well-recognized illness (ie, cirrhosis, CHF, nephrosis, disseminated carcinomatosis). Abdominal paracentesis may be required to establish the diagnosis. Exudative ascites should initiate an evaluation for a primary peritoneal process, most importantly infection or tumor. Transudative ascites is frequently due to cirrhosis, right-sided venous hypertension raising the hepatic sinusoidal pressure, or hypoalbuminemic states (eg, nephrosis, protein-losing enteropathy). Strongly consider right-sided valvular diseases of the heart and, in particular, constrictive pericarditis. Establishing a diagnosis may require cardiac imaging and cardiac catheterization. Patients with a prosthetic metallic aortic valve may exhibit pallor because of the development of anemia from RBC destruction (and production of schistocytes). Pallor and anemia are also observed in those with bacterial endocarditis and in patients with acute coronary syndromes who develop blood loss following treatment with thrombolytic therapy, heparin, or powerful intravenous platelet-inhibiting agents. Pallor, as shown below, of the skin and mucous membranes is loss of the normal red or pink hue when a drop in the hemoglobin level occurs to less than 8-10 g/dL. Pallor may be difficult to identify in patients with CHF or subcutaneous edema, low skin blood flow, or dark-colored skin. Focus the examination on areas where vessels are close to the surface (eg, mucous membranes of conjunctiva, inner surface of lower eyelids, nail beds, palmar creases of the hands). Pallor seen in a patient with anemia due to erythrocyte damage from a prosthetic aortic valve. A complete blood cell count, reticulocyte count, and measurements of serum iron, total iron-binding capacity, and serum ferritin are needed. In patients with severe anemia and abnormalities in RBC morphology, a bone marrow aspirate and biopsy may be required. In cases of increased RBC destruction or hemolysis, the anemia is easily identified from the increased reticulocyte count, along with normocytic RBC morphology. This indicates the capacity of the erythroid marrow to compensate for a blood loss with an increase in RBC production. Management begins at the time of assessment. When an anemia is severe enough to threaten survival, immediate steps must be taken to guarantee oxygen delivery to tissues through the appropriate infusion of electrolyte and colloid solutions and RBC transfusions along with supplemental oxygen, and essential vitamins or chemotherapeutic agent(s) should be administered to address a specific cause. In less severe anemia, withhold transfusions and other therapy until the diagnosis is established. The selection of the right therapy should be based on the documented cause. Often, more than one etiologic component must be addressed in management. A case-control study  examined the association of dermatological signs, such as baldness, thoracic hairiness, hair graying, and diagonal earlobe crease, with the risk of myocardial infarction in male subjects younger than 60 years. It included 842 male subjects admitted for the first nonfatal myocardial infarction; the controls were 712 male subjects admitted with noncardiac diagnoses, without clinical signs of coronary disease. The relative risks were estimated as odds ratios. Logistic regression was used to control for the confounding variables. Baldness, thoracic hairiness, and earlobe crease were approximately 40% more prevalent in noncontrol subjects. After allowing for age and other established coronary risk factors, the relative risk of myocardial infarction for frontoparietal baldness compared with no hair loss was 1.77 (95% confidence interval 1.27-2.45) and it was 1.83 (95% confidence interval 1.4-2.3) for men with thick, extended thoracic hairiness. The presence of a diagonal earlobe crease yielded a relative risk of 1.37 (95% confidence interval 1.25-1.5), while hair graying was associated with myocardial infarction only in male subjects younger than 50 years. The authors concluded that baldness, thoracic hairiness, and diagonal earlobe crease indicate an additional risk of myocardial infarction in men younger than 60 years, independent of age and other established coronary risk factors. In a report by Matilainen et al,  the presence of insulin resistance that increases coronary disease risk has been shown to be associated with an early onset of male-pattern baldness or alopecia. This may represent a common pathogenetic mechanism for baldness and coronary atherosclerosis. Petechiae are found most frequently on the conjunctivae, palate, buccal mucosa, and upper extremities. They are found in persons with infective endocarditis. Splinter hemorrhages are subungual, linear, dark-red streaks that may appear in persons with infective endocarditis. Roth spots are oval, retinal hemorrhages with a clear, pale center. Differential diagnoses include connective-tissue disease and severe anemia. They are noted in persons with infective endocarditis. Osler nodes are small, tender nodules that develop on the finger or toe pads in patients with infective endocarditis. They persist for hours to days. Janeway lesions are small hemorrhages with a slightly nodular appearance that occur on the palms and soles. They are most common in persons with acute infective endocarditis. Embolic episodes are common in patients with infective endocarditis, and they may occur during or after therapy. Emboli to large arteries (eg, femoral arteries) are often the result of fungal endocarditis, with its large, friable vegetations. Pulmonary emboli are common in patients with history of drug abuse who develop right-sided endocarditis. They also may be seen in patients with left-sided endocarditis who have left-to-right cardiac shunts. Peripheral arterial septic emboli from valvular bacterial endocarditis are also seen. These may result in digital infarcts. Livedo reticularis is a dermatologic manifestation of atherosclerotic or cholesterol embolization in which localized areas of the extremities develop a mottled or netlike appearance of bluish-to-red discoloration. The mottled appearance becomes particularly more prominent upon exposure to cold. Atheroembolism is a form of acute arterial occlusion in which numerous small debris of fibrin, platelet, and cholesterol embolize distally from proximal atherosclerotic or aneurysmal sites. It may follow intra-arterial procedures. Because the emboli tend to lodge in the smallest vessels, distal pulses in the large vessels usually remain palpable. Patients present with acute pain and tenderness at the site of embolization. Vascular occlusion in the fingers and toes may result in ischemia (ie, blue toe syndrome). Digital necrosis and gangrene may develop. Skin or muscle biopsy findings may exhibit cholesterol crystals. Ischemia resulting from atheroemboli is difficult to treat because neither surgical revascularization nor thrombolysis is helpful because of their multiplicity, mixed composition, and distal location. Platelet inhibitors may prevent atheroembolism if given prior to the intra-arterial intervention. For recurrent embolization, surgical removal or bypass of the atherosclerotic vessel or aneurysm may be necessary. Eruptive xanthomas are the most common form of xanthomas, and they are associated with hypertriglyceridemia types I, III, IV, and V. They appear as crops of yellow-orange papules with erythematous halos on the extensor surfaces of the extremities and the buttocks. They usually appear when triglyceride levels are greater than 11 mmol/L (1000 mg/dL), ie, when chylomicronemia is present. At these high levels of triglycerides, the retinal vessels can appear orange-yellow (lipemia retinalis). They can spontaneously diminish with a fall in serum lipid levels. Xanthelasma palpebrarum is found on the eyelids (see the image below). Xanthelasma palpebrarum in a patient with familial hypercholesterolemia. Biopsy specimens of xanthomas show collections of lipid-containing macrophages (foam cells). The lipid compositions of 8 normolipidemic xanthelasma palpebrarum lesions were analyzed in a recent study using thin-layer chromatography, with the adjacent uninvolved skin used as a control. The lesions were found to be composed predominantly of cholesterol, mostly cholesterol ester, whereas phospholipids predominated in the control specimens. Probucol, bichloracetic acid, or cryotherapy  may be effective for eyelid xanthelasmas. The UltraPulse carbon dioxide laser also may be helpful. Excision with healing by secondary intention and microsurgical inverted peeling are surgical options. Infants with supravalvular aortic stenosis syndrome (Williams syndrome) exhibit elfin facies. This is characterized by a high prominent forehead, stellate iris patterns, epicanthal folds, underdeveloped mandible and bridge of the nose, overhanging upper lip, strabismus, and dental abnormalities. The mechanism may include problems with regulation of circulating 25-hydroxyvitamin D and with metabolism of calcitonin. These patients also may show mental retardation, facial and skeletal defects, and narrowing of the peripheral and pulmonary arteries. Marfan syndrome is an inherited connective-tissue disorder transmitted as an autosomal dominant trait. The patients with severe Marfan syndrome exhibit long, thin extremities with other skeletal changes, ocular lens dislocation (ectopia lentis), and aortic aneurysm. The severe form is caused by a mutation in a single allele of the fibrillin gene (FBN1). Typical facies include dolichocephaly, malar hypoplasia, and enophthalmos. Most patients are heterozygotes for mutations in a gene on chromosome 15 that encodes fibrillin, a 350-kd glycoprotein that is a major component of elastin-associated microfibrils. These microfibrils are abundant in large blood vessels and the suspensory ligaments of the lens. Approximately one third of the mutations cause premature termination of translation, and most of the remainder cause single amino acid substitutions in the epidermal growth factor–like domains of the molecule that may be involved in calcium binding. Its incidence is approximately 1 case in 10,000 persons, and it is inherited as an autosomal dominant trait. A quarter of patients are affected as a result of new mutations. Cardiovascular abnormalities are the major source of morbidity and mortality. These include mitral valve prolapse and dilatation of the root of the aorta and the sinuses of Valsalva, causing aortic regurgitation, dissection, and rupture. With regard to skeletal features, patients are tall with a shorter upper segment (top of the head to top of the pubic ramus) than the lower segment (top of the pubic ramus to the floor). The ratio of these measurements is abnormal by 2 standard deviations. The fingers are long, slender, and spiderlike (arachnodactyly). Patients may have chest deformities (pectus excavatum, pectus carinatum), scoliosis, kyphosis, high-arched palate, and high pedal arches or pes planus. Ocular features may include dislocation of the lens, myopia, retinal detachment, lattice degeneration, and retinal tears; however, most patients have adequate vision. Other features are striae over the shoulders and buttocks and the development of spontaneous pneumothorax, inguinal hernias, and incisional hernias. The diagnosis can be established if the patient has dislocated lenses, aortic dilatation, and long and thin extremities along with kyphoscoliosis or other chest deformities (ie, Marfan habitus). All patients in whom the diagnosis is suggested should undergo a slit-lamp examination and an echocardiogram. Marfan syndrome has no specific treatment. Propranolol or other beta-adrenergic blocking agents may delay or prevent aortic dilatation. Surgical replacement of the aorta, aortic valve, and mitral valve has been helpful in some patients. All patients should be monitored carefully with echocardiographic and clinical evaluations. Patients should be advised of the risks of severe physical and emotional stress and of pregnancy, all of which worsen the cardiovascular manifestations. Scoliosis can be treated by mechanical bracing and physical therapy if less than 20° or by surgery if it progresses to 20-45°. Dislocated lenses rarely require surgical removal, but patients must be monitored closely for retinal detachment. This syndrome encompasses a rare combination of atrial septal defect and mitral stenosis, which is almost always the result of acquired rheumatic valvulitis. Ellis-van Creveld syndrome includes ectodermal dysplasia and polydactyly. Down syndrome is characterized by typical moon facies. Both are associated with AV septal defects. AV septal defects account for 4-5% of congenital heart defects. Malformations are characterized by varying degrees of incomplete development of the lower portion of atrial septum, the inflow of the ventricular septum, and the AV valves (endocardial cushion defects and AV canal defects). The basic defect is a deficiency of the AV septum, which separates the left ventricular inflow from the right atrium. The anomalies range from a small ostium primum atrial defect to a complete AV malformation involving defects in the interventricular septum and the mitral and tricuspid valves. The common AV valve frequently is abnormal, with 5 or 6 leaflets of variable size. An association of aortic arch interruption is commonly seen with DiGeorge syndrome. Other features include cardiac, parathyroid, thymic, and facial anomalies. Thymic hypoplasia is accompanied by immunological and hypocalcemia problems. The major morbidity is severe CHF due to (1) left ventricular volume overload resulting from the left-to-right shunt and (2) pressure overload from systemic hypertension. Physical findings include cardiomegaly, a systolic ejection sound accompanied by a thrill, a loud single second heart sound, a harsh systolic murmur, a low-pitched middiastolic rumbling murmur, and bounding pulses. Facial dysmorphism; malformations of the limbs, kidneys, and intestines; atrophy or absence of the thymus gland; T-lymphocyte deficiency; and a propensity for infections also may be features of the clinical presentation. Congenital heart block is observed in some infants born to mothers with systemic lupus erythematosus. This may be due to various factors, such as fetal myocarditis, idiopathic hemorrhage and necrosis involving conduction tissue, degeneration and fibrosis related in some instances to the transplacental passage of anti-Ro/ss-A antibody, and other immune complexes from mothers. Neonatal lupus erythematosus and its dermatologic manifestations were reviewed by Neiman et al. They studied 47 mothers (83% white) whose sera contained anti-SSA/Ro, anti-SSB/La, and/or anti-U1-ribonucleoprotein antibodies and their 57 infants (20 boys and 37 girls) diagnosed with cutaneous neonatal lupus erythematosus. The infants' rashes often followed ultraviolet light exposure; the mean age at detection was 6 weeks, and the mean duration was 17 weeks. All had facial involvement (periorbital region most common) followed by the scalp, trunk, extremities, neck, and intertriginous areas. In 37, the rash resolved without sequelae, 43% of which were untreated. A quarter had residual sequelae that included telangiectasia and dyspigmentation. Of 20 subsequent births, 7 children were healthy, 2 had congenital heart block only, 4 had congenital heart block and skin rash, and 7 had skin rash only. They concluded that future pregnancies should be monitored by serial echocardiograms, given the substantial risk for heart block, and that the affected neonates should be observed for later development of heart disease. Patients with Turner syndrome often show congenital cardiac abnormalities (eg, coarctation of aorta). Patients present with upper extremity hypertension. Early surgical repair in childhood is associated with 89% survival at 15 years and 83% survival at 25 years. Postoperative sequelae are common. Three principal postoperative sequelae include residual systolic hypertension despite the absence of a coarctation gradient, bicuspid aortic valve, and recoarctation. Surgical resection with end-to-end anastomosis results in the lowest incidence of recoarctation. Balloon dilatation has been helpful in the treatment of recoarctation, but not of the native coarctation. The RAS/MAPK pathway plays an important role in signal transduction of extracellular stimuli. This pathway is important for cellular processes, and germline mutations can interfere with craniofacial, cardiac, ectodermal, hematopoietic, musculoskeletal, and central nervous defects. Cardio-facio-cutaneous syndrome, Costello syndrome, and Noonan syndrome are all due to germline mutations in this pathway that make these patients more likely to have congenital heart defects and hypertrophic cardiomyopathy. Many systemic diseases with concomitant cutaneous manifestations also involve the cardiovascular system. Such diseases are discussed in this section. Characteristic eruptions as described by Jones (eg, erythema marginatum) and skin nodules may be associated with concomitant acute carditis with valvular disease and CHF. Erythema marginatum is seen primarily on the trunk. Lesions are pinkish red, flat to mildly elevated, and transient. Systemic lupus erythematosus may be associated with myocarditis (heart block) and cutaneous lupus stigmata (see the image below). Complete heart block as seen in a patient with neonatal lupus erythematosus. Systemic lupus erythematosus with lupus anticoagulant has been linked to an increased prevalence of arterial thrombosis. Cardiomyopathy (restrictive) and cutaneous manifestations of primary systemic amyloidosis may coexist. Primary systemic amyloidosis consists of immunoglobulin light chains that accumulate in tissue, resulting in organ dysfunction. Up to 40% of affected individuals have skin findings, which include nonpalpable purpura. Patients may also have macroglossia, alopecia, and waxy papules, nodules and plaques. Cardiac involvement can include heart block, restrictive cardiomyopathy, and heart failure. Cardiomyopathy, supraventricular arrhythmias, or atrial fibrillation in persons with Graves disease can be associated with ocular proptosis. 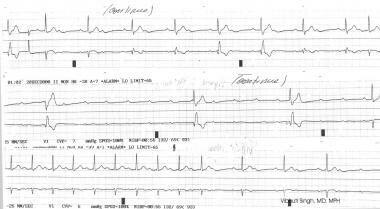 Heart block (second-degree Mobitz type II and third-degree heart block) in a patient with sarcoidosis. Aortitis and skin manifestations of secondary syphilis often coexist. In secondary syphilis, scattered red-brown papules with thin scaling are noted. The eruption often involves the palms and soles, and it can resemble pityriasis rosea. Associated findings that are helpful in making the diagnosis include annular plaques on the face, nonscarring alopecia, condyloma lata (broad-based and moist), mucous patches, lymphadenopathy, malaise, fever, headache, and myalgias. The interval between the primary chancre and the secondary stage is usually 4-8 weeks, and spontaneous resolution without appropriate therapy can occur. Hypotension is found in patients with hyperpigmentation and other skin manifestations of hypoadrenalism (Addison disease). The form of hyperpigmentation seen with hypoadrenalism includes darkening of the skin, which may be of equal intensity over the entire body or it may be accentuated in sun-exposed areas. The differential diagnoses can be endocrine-, metabolism-, autoimmune-, or drug-related. The endocrinopathies that frequently have associated hyperpigmentation include Addison disease, Nelson syndrome, and ectopic adrenocorticotropic hormone syndrome. Mönckeberg sclerosis of the arteries is found in association with cutaneous features of pseudoxanthoma elasticum. 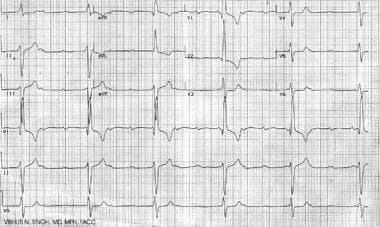 Patients present with myopathic facies and hypotension or syncope. These patients present with skin manifestations of acromegaly (gigantism) and Cushing disease. They develop hypertension and accelerated coronary artery disease. These patients present with dermatologic features of dermatomyositis. Rarely, they may also develop myocarditis. Patients with systemic sclerosis may develop pulmonary hypertension and pericarditis. In scleroderma, the dilated blood vessels have a unique configuration and are known as mat telangiectasias. The lesions are wide macules measuring 2-7 mm in diameter; occasionally, they are larger, polygonal or oval, and uniformly red. The most common locations are the face, oral mucosa, and hands, ie, peripheral sites prone to intermittent ischemia. The CREST (calcinosis cutis, Raynaud phenomenon, esophageal dysmotility disorder, sclerodactyly, and telangiectasia) syndrome variant of scleroderma is associated with a chronic course and anticentromere antibodies. Mat telangiectasias are also an important clue to the diagnosis of the CREST syndrome and systemic scleroderma. Hyperpigmentation can be seen in patients with scleroderma. It is accompanied by sclerosis of the extremities, face, and, less commonly, the trunk. Additional clues to the diagnosis of scleroderma are telangiectasias, calcinosis cutis, Raynaud phenomenon, and distal ulcerations. Myocarditis and mitral valve involvement are often observed in patients with hepatosplenomegaly, kyphosis, joint disease, and contractures (mucopolysaccharidosis). Varicose veins and venous stasis with skin discoloration. Drug rashes are often seen with the use of penicillins and sulfa drugs for treatment of syphilis, rheumatic fever, and other described infections with cardiac manifestations. Quinidine used for treatment of arrhythmias may cause thrombocytopenic purpura. Heparin-induced thrombocytopenia can cause petechiae. Sites of subcutaneous injections of low molecular weight heparins show ecchymoses. Use of calcium blockers and ACE inhibitors may lead to edema. Amiodarone can cause thyroid changes and secondary skin manifestations. Diffuse hyperpigmentation due to drugs or metals can result from one of several mechanisms (eg, induction of melanin pigment formation, complexing of the drug or its metabolites to melanin, deposits of the drug in the dermis). Administration of amiodarone can result in both a phototoxic eruption (exaggerated sunburn) and/or a brown or blue-gray discoloration of sun-exposed skin. Biopsy specimens of the latter show yellow-brown granules in dermal macrophages, which represent intralysosomal accumulations of lipids, amiodarone, and its metabolites. Thrombolytic therapy can cause localized cutaneous necrosis. Artificial heart valves can cause hemolysis and related anemia or jaundice. Implanted pacemakers or defibrillators cause obvious skin swelling, as shown below, and their presence may be complicated by cutaneous erosion or sepsis. Patient showing pacemaker swelling under the left subclavicular region. He also has a midsternal bypass graft scar. Keloid formation is possible over midsternal scars after coronary bypass procedures. Livedo reticularis can develop from the use of streptokinase. Administration of warfarin can cause painful areas of erythema that may become purpuric and necrotic with a black eschar. This is more common in women and in areas with abundant subcutaneous fat (eg, breasts, abdomen, buttocks, thighs, calves). The erythema and purpura develop 3-10 days after the onset of therapy. This may be a result of an imbalance in the levels of anticoagulant and procoagulant vitamin K–dependent factors. Continued therapy does not exacerbate preexisting lesions; patients with an inherited or acquired deficiency of protein C are at increased risk for this particular reaction and for purpura fulminans. Ecchymosis, as shown below, may result following anticoagulation with the intravenous glycoprotein IIa/IIIa inhibitor, abciximab, during angioplasty and stenting of the coronary artery. Ecchymosis following intravenous anticoagulation with the glycoprotein IIb/IIIa inhibitor, abciximab, during angioplasty and stenting of the coronary artery. Many dermatologic manifestations are found in patients with cardiovascular disease that are either directly or indirectly related to the cardiac involvement or are due to cardiovascular therapeutic interventions. Often, such skin changes assume great importance in making a diagnosis or predicting prognosis. The diagnosis of acute rheumatic fever in patients presenting with acute carditis includes the presence of erythema marginatum and subcutaneous nodules. Patients presenting with Marfan syndrome may have aortic aneurysm, mitral valve prolapse, tall habitus, arachnodactyly, and a high-arched palate. Many congenital cardiac disorders are associated with unique cutaneous manifestations as part of well-defined syndromes (eg, coarctation of the aorta in patients with external features of Turner syndrome, AV septal defects in patients with Down syndrome). The dermatologic manifestations frequently represent a systemic or vascular disorder that also involves the cardiovascular system. Furthermore, the institution of medical and surgical or invasive therapies has led to the development of numerous new cutaneous signs, such as angioedema from ACE inhibitors, ankle swelling from calcium channel blockers, and radiation skin burns following prolonged angioplasty or radiographic procedures, just to name a few. The knowledge of various dermatologic manifestations associated with cardiovascular disorders has the potential to be of tremendous help in making diagnoses and in predicting and recognizing complications associated with the ever-increasing armamentarium of pharmacologic and device therapies. American Heart Association. Guidelines for the diagnosis of rheumatic fever. Jones Criteria, 1992 update. Special Writing Group of the Committee on Rheumatic Fever, Endocarditis, and Kawasaki Disease of the Council on Cardiovascular Disease in the Young of the American Heart Association. JAMA. 1992 Oct 21. 268(15):2069-73. [Medline]. Suzuki S, Furui S, Kohtake H, Yokoyama N, Kozuma K, Yamamoto Y. Radiation exposure to patient's skin during percutaneous coronary intervention for various lesions, including chronic total occlusion. Circ J. 2006 Jan. 70(1):44-8. [Medline]. Kunz M, König IR, Schillert A, et al. Genome-wide association study identifies new susceptibility loci for cutaneous lupus erythematosus. Exp Dermatol. 2015 Jul. 24 (7):510-5. [Medline]. Arivazhagan S, Kadhiravan T, Basu D, Dutta TK. Validation of the megakaryocyte fragmentation theory of finger clubbing in patients with cardiopulmonary diseases. Platelets. 2013 Aug 2. [Medline]. Wyre HW Jr. The diagonal earlobe crease: a cutaneous manifestation of coronary artery disease. Cutis. 1979 Mar. 23(3):328-31. [Medline]. Korkmaz L, Agaç MT, Erkan H, Acar Z, Gurbak I, Bektas H, et al. Association between Diagonal Earlobe Crease and Cardio-Ankle Vascular Index in Asymptomatic Hypertensive Patients. Med Princ Pract. 2013 Aug 12. [Medline]. Korkmaz L, Agaç MT, Acar Z, Erkan H, Gurbak I, Kurt IH, et al. Earlobe Crease May Provide Predictive Information on Asymptomatic Peripheral Arterial Disease in Patients Clinically Free of Atherosclerotic Vascular Disease. Angiology. 2013 Feb 28. [Medline]. Miric D, Fabijanic D, Giunio L, Eterovic D, Culic V, Bozic I, et al. Dermatological indicators of coronary risk: a case-control study. Int J Cardiol. 1998 Dec 31. 67(3):251-5. [Medline]. Matilainen V, Koskela P, Keinanen-Kiukaanniemi S. Early androgenetic alopecia as a marker of insulin resistance. Lancet. 2000 Sep 30. 356(9236):1165-6. [Medline]. Milionis HJ, Miltiadous GA, Cariolou M, Elisaf MS. Pinpoint skin lesions in a familial hypercholesterolaemia homozygote. Acta Paediatr. 2003 Sep. 92(9):1109-10. [Medline]. Ribera M, Pinto X, Argimon JM, Fiol C, Pujol R, Ferrandiz C. Lipid metabolism and apolipoprotein E phenotypes in patients with xanthelasma. Am J Med. 1995 Nov. 99(5):485-90. [Medline]. 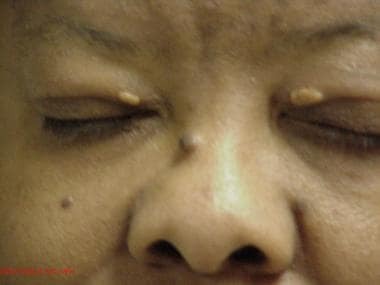 Bergman R. Xanthelasma palpebrarum and risk of atherosclerosis. Int J Dermatol. 1998 May. 37(5):343-5. [Medline]. Bergman R. The pathogenesis and clinical significance of xanthelasma palpebrarum. J Am Acad Dermatol. 1994 Feb. 30(2 Pt 1):236-42. [Medline]. 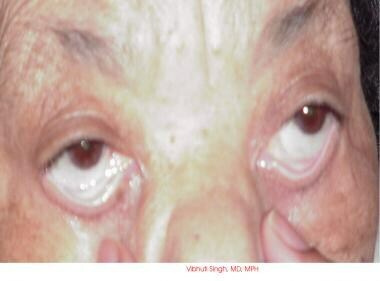 Dey A, Aggarwal R, Dwivedi S. Cardiovascular profile of xanthelasma palpebrarum. Biomed Res Int. 2013. 2013:932863. [Medline]. [Full Text]. Hawk JL. Cryotherapy may be effective for eyelid xanthelasma. Clin Exp Dermatol. 2000 Jun. 25(4):351. [Medline]. Ledoux M, Beauchet A, Fermanian C, Boileau C, Jondeau G, Saiag P. A case-control study of cutaneous signs in adult patients with Marfan disease: diagnostic value of striae. J Am Acad Dermatol. 2011 Feb. 64(2):290-5. [Medline]. Neiman AR, Lee LA, Weston WL, Buyon JP. Cutaneous manifestations of neonatal lupus without heart block: characteristics of mothers and children enrolled in a national registry. J Pediatr. 2000 Nov. 137(5):674-80. [Medline]. Korf B, Ahmadian R, Allanson J, Aoki Y, Bakker A, Wright EB, et al. The third international meeting on genetic disorders in the RAS/MAPK pathway: towards a therapeutic approach. Am J Med Genet A. 2015 Aug. 167A (8):1741-6. [Medline]. Ribeiro de Castro MC, de Aquino AM, Camilo C, Maceira JP, Ramos-e-Silva M. Cardio-facio-cutaneous syndrome: a case report. Int J Dermatol. 2002 Dec. 41(12):923-5. [Medline]. Siegel DH, McKenzie J, Frieden IJ, Rauen KA. Dermatological findings in 61 mutation-positive individuals with cardiofaciocutaneous syndrome. Br J Dermatol. 2011 Mar. 164(3):521-9. [Medline]. Newburger JW, Takahashi M, Gerber MA, et al. Diagnosis, treatment, and long-term management of Kawasaki disease: a statement for health professionals from the Committee on Rheumatic Fever, Endocarditis and Kawasaki Disease, Council on Cardiovascular Disease in the Young, American Heart Association. Circulation. 2004 Oct 26. 110 (17):2747-71. [Medline]. Kibata T, Suzuki Y, Hasegawa S, Matsushige T, Kusuda T, Hoshide M, et al. Coronary artery lesions and the increasing incidence of Kawasaki disease resistant to initial immunoglobulin. Int J Cardiol. 2016 Mar 28. 214:209-215. [Medline]. Savino F, Viola S, Tarasco V, Locatelli E, Ricagni A, Coppo P. Neonatal lupus erythematosus: a cutaneous cases based update. Ital J Pediatr. 2016 Jan 7. 42 (1):1. [Medline]. Roh EK, Ali M, Lu MT, Bradshaw SH. Case 2-2016. N Engl J Med. 2016 Jan 21. 374 (3):264-74. [Medline]. Drago F, Ciccarese G, Cittadini G, Drago F, Rosa GM, Cozzani E, et al. Cardiac involvement in cutaneous sarcoidosis: case reports and review of the literature. G Ital Dermatol Venereol. 2015 Sep 16. [Medline]. Wessendorf TE, Bonella F, Costabel U. Diagnosis of Sarcoidosis. Clin Rev Allergy Immunol. 2015 Aug. 49 (1):54-62. [Medline]. Scheffold N, Herkommer B, Kandolf R, May AE. Lyme carditis--diagnosis, treatment and prognosis. Dtsch Arztebl Int. 2015 Mar 20. 112 (12):202-8. [Medline]. D'Andrea A, Bellissimo S, Scotto di Uccio F, Vigorito F, Moscato F, Tozzi N, et al. Associations of right ventricular myocardial function with skin and pulmonary involvement in asymptomatic patients with systemic sclerosis. Ital Heart J. 2004 Nov. 5(11):831-9. [Medline]. Dabus G, Linfante I, Benenati J, Perlyn CA, Martínez-Galdámez M. Interventional management of high-flow craniofacial vascular malformations: a database analysis and review of the literature. J Neurointerv Surg. 2016 Mar 30. [Medline]. Spiker A, Zinn Z, Carter WH, Powers R, Kovach R. Fluoroscopy-induced chronic radiation dermatitis. Am J Cardiol. 2012 Dec 15. 110 (12):1861-3. [Medline]. Garcia Moreno JM, Sobrino Marquez JM, Elizalde Eguinoa J, Leon de Lope M, Rodriguez Vera FJ. [Benign atheroembolic syndrome secondary to systemic fibrinolysis with streptokinase]. Rev Esp Cardiol. 1999 Jun. 52(6):454-6. [Medline]. Dermatologic manifestations of cardiac disease. Sternotomy scar following bypass surgery.